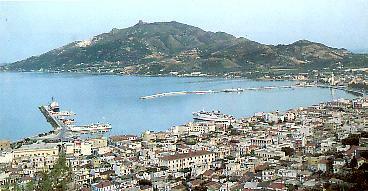 Zakinthos, the southernmost of the lonian islands, owes its name to the son of Dardanos, the king of Troy, who according to myth built the first city here. It is also mentioned in "The Iliad". Áll who came to this island fell under its spell. The Venetians baptized it "the flower of the Orient" (Fior' di Levante). Others gave it just as evocative names like "earthly paradise", and "Perfumed Isle", while Dionysios Solomos, the father of modern Greek poetry and a native son, wrote "Zakinthos could make one forget the Elysian Fields. No one who has been here can forget the emerald green of its sea, its pine-studded mountains, its musical people and their hospitality. The first thing to welcome you, as soon as you step off the ferryboat, is the town of Zakinthos. Though it lost all but three of its buildings in the earthquake of 1953, the town has been meticulously reconstructed and its former layout has been faithfully preserved. Zakinthos today has pleasantly arcaded wide streets, spacious squares imposing buildings and cheerful houses. The Museum of Post-Byzantine Art on Solomos Square contains treasures salvaged from the island's historic churches. Ïn the waterfront, one should visit the churches of Agios Dionysios, the island's patron saint, with its tall campanile, and of Agios Nikolas tou Ìïlïõ, a church out of the Italian Renaissance with, surprisingly, a l7th century Byzantine belfry. If you walk along the flagstoned coastal promenade, the so-called Strata Marina between the two churches, at dusk, you'll get the true flavour of the tïwn Sometimes it seems as if the whole population is out enjoying the ritual of the evening stroll. The street is lined with small cafes and shops selling folk art. Don't leave before tasting the famous Zakinthos "mandolato" or nougat; it's a real treat. The town is watched over by the Venetian fortress on the hill above. Ïnly the gate, outer walls and battlements still stand. But from this vantage point a spectacular view can be had of the harbour, fertils inland plain and beaches as far as the eye can see. Nearby is another hill, the Lofos Strani where Solomos Dionysios composed the famous, the father of modern Greek poetry "Hymn to Libertã", which became the Greek National Anthem. Zakynthos is almost triangular in shape, with two green mountainous promontories extending into the sea to form the huge bay of Laganas. There are more pine-covered mountains and hills in the north, but the centre is gentle and lush, richly planted with currant vines, olive trees, almonds and seasonal vegetables. 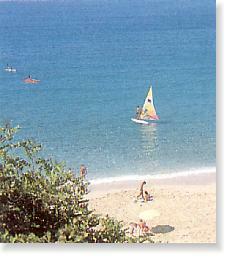 There are dozens of beaches to choose from, sandy and sheltered with invitingly sparkling water. Flowers of every kind fill every available space, filling the air with the scent that so enraptured visitors of old. With a sunny climate most of fhe year and good roads to facilitate exploring, Zakinthas lends itself to holiday- making in spring and fall as well as summer. Some of the best known summer resorts are Argassi, Aiikes, Planos, Tsilivi, Vassilikos, Gerakas and Porto Roma, while Laganas is the most famous of all. Its long beach and wide range of facilities attract thousands of tourists from Ìay through September. 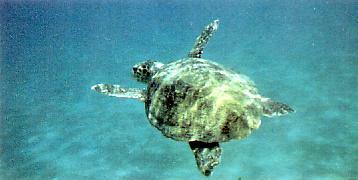 At Laganas, Vassilikos and Gerakas, the endangered sea turtle Caretta Caretta also comes to lay her eggs. 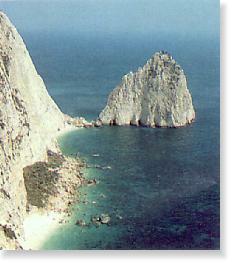 Apart from its beaches, Zakinthos has many other wonderful places to get to know. For exampie, there's the village of Anafonitria, with its fascinating l5th century monastery dedicated to the Virgin. And Maherado, with its two l4th century churches, the half-ruined Ypapanti and the sumptuously decorated Agia Mavra. Or the mountain village of Keri, where sooner or later everyone goes to admire the sunset and the stupendous view of the seacaves below. Heading north, don't miss Volimes or Skinari at the tip of the island. Volimes has a wonderful Venetian tower and lovely old churches with frescoes dating to the l2th and l4th centuries, while Skinari is where the famous Blue Caves are located. Inside the caves, the refraction of the sun's rays on the water creates an unbelievable array of blue and silver tones of a dreamlike beauty. Further south is the cave of Xingia, where there is a spring of suiphurous water that bubbles up white, clouding the sea up to 500 metres from shore.